Heat gas or charcoal grill. In small bowl, mix all dressing ingredients with wire whisk; reserve 2 tablespoons. On each of 2 (10-inch) metal skewers, thread pineapple, leaving 1/4-inch space between each piece. 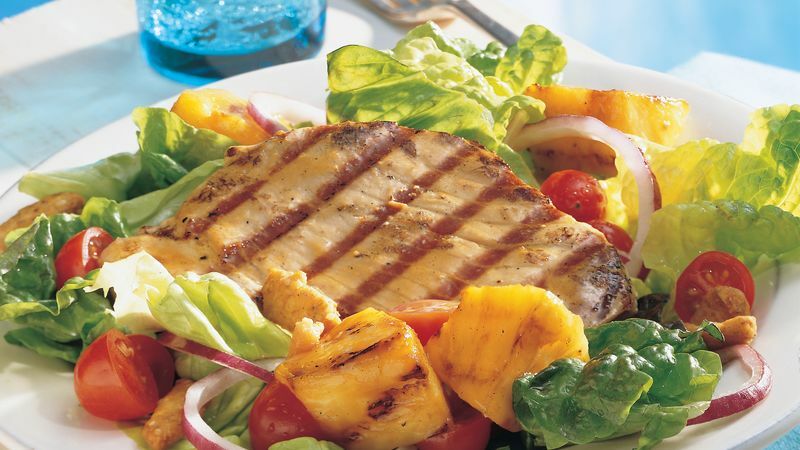 Brush 1 tablespoon of the reserved dressing on pineapple; brush remaining 1 tablespoon reserved dressing on tuna. Carefully spray grill rack with cooking spray. Place tuna on grill. Cover grill; cook over medium heat about 10 minutes, turning once and adding pineapple for last 5 minutes of grilling, until fish flakes easily with fork and is slightly pink in center. Among 4 plates, divide salad greens, tomatoes and onion. Top each with pineapple and tuna. Sprinkle with sesame sticks. Serve with remaining dressing. Stir-fry sauce can be substituted for the teriyaki baste and glaze. Choose a stir-fry sauce that has a syrup-like, not watery, consistency so it's similar to the teriyaki baste and glaze. If you can't find the sesame oat bran sticks, croutons flavored with onion and garlic can be substituted. Teriyaki baste and glaze has a thick, syrup-like consistency and shouldn't be confused with teriyaki marinade or sauce, which is more watery. Look for this tasty and versatile product in the Asian foods aisle.